A colorful perspective on agriculture, water, and pollution. Kaphar’s painting uses defacement as a way of critiquing Andrew Jackson, and makes us consider the injustices of presidents past and present. Pippin, like many other black Americans, fought bravely for democracy in World War I and yet there would be no real victory without winning the struggle for equality in the U.S.
Rockwell's Rosie captured the power felt by the unprecedented number of women in the workforce during World War II. This powerful image raises broad questions of racial, national, and individual identity during the height of civil rights activism in the United States. Who was Andy Warhol? What is Romanticism? Can abstract art mean something? The art and architecture produced from the early 1300s to the end of the 1700s laid the foundation for the world we live in now. Long before our global world, works of art often demonstrate rich interaction across cultures. 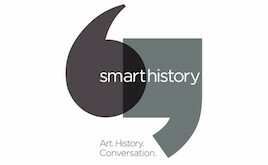 This is a multimedia learning resource for American history and American art.